The objective of this lab is to become more familiar with the HP 3585A Spectrum Analyzer. This will be accomplished by making several spectral measurements and then making calculations based on those measurements. 1)	Set the spectrum analyzer to use the 1MW input, have fc of 1MHz and have a frequency span of 500KHz. 2)	Use the generator to generate a 1KHz sinewave. 3)	Measure the total harmonic distortion over the first five harmonics. 4)	Repeat step 3 for a 10KHz signal. 6)	Generate a 10KHz square wave and compare the spectrum with the calculated one. 7)	Repeat step 6 using a triangle wave. 8)	Design a low pass filter with a cutoff frequency of 20KHz. 9)	Calculate the spectrum of a 10KHz square wave passed through this filter. 10)	Construct the filter and observe the actual spectrum of a 10KHz square wave. 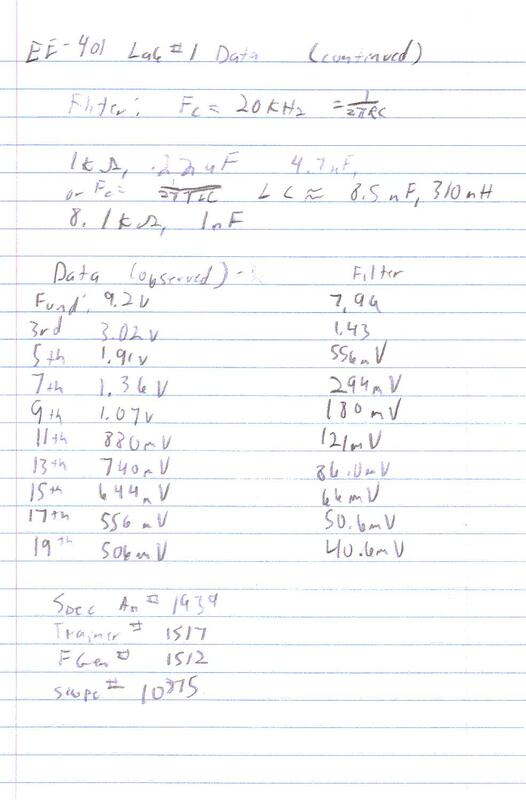 11)	Compare the two spectra. 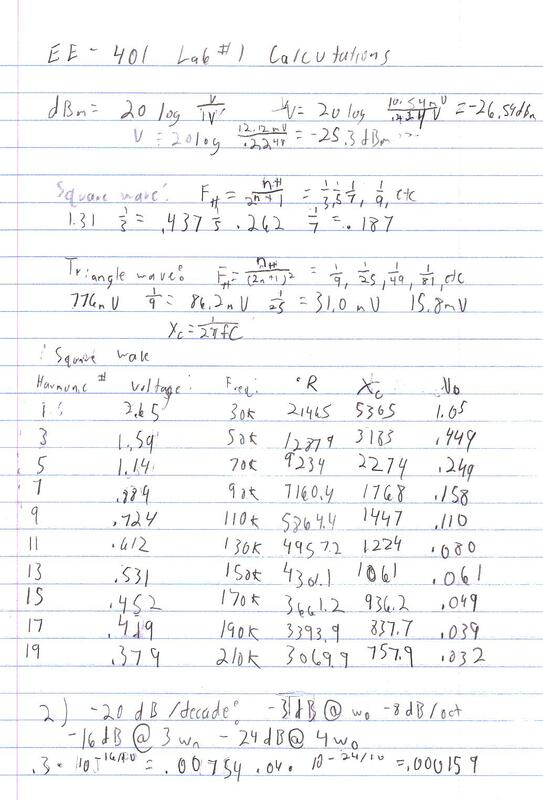 12)	Repeat steps 9 - 11 for a triangle wave. 5)	Table 5: Harmonics of a 10KHz Square Wave Passed Through a Low - Pass Filter with a Critical Frequency of 20KHz. 1)	Q:	What is the total harmonic distortion of the following wave: .5coswot + .3cos3wot + .04cos4wot? 2)	Q:	If the wave in Q1 was passed through a low pass filter with a cutoff	frequency of wo, what would the total harmonic distortion be? This lab has demonstrated the basic functionality of the HP3585A spectrum analyzer. I am fairly confident in the results. Even though the % error was high on the last phase I believe that it was due to the accuracy of the capacitor. Also, the calculations were not based on the harmonic distortions found in the square wave which could have contributed significantly. Also, I have found that the spectrum it's self has a significant amount of inaccuracy associated with it. 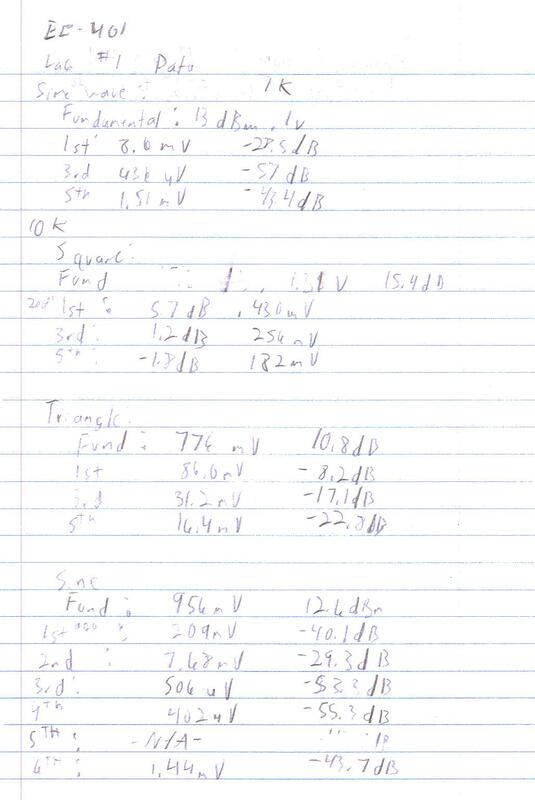 Also, I am not sure of the total harmonic distortion calculations are entirely accurate. I believe that there may be errors. My method, which was just summing the individual overtone errors, I do not believe is correct. Other than that, most of the data in this lab should be fairly accurate.